Schwarze Katze bringt Glück! ... Nette Mitarbeiter, tolle Konzert, süße Katze (wie viele, weiß ich doch nicht:), Natur in Umgebung, Gemütlichkeit. Allein oder mit Kindern - komme ich wieder, ohne Zweifel. Are you looking for a place where you can sleep, relax and enjoy yourself? The BOLA Cultural Hostel is the place for you! Located in the middle of a forest on top of a hill you can reach us easily - by walking and breathing pure air as well as by car or public transport. 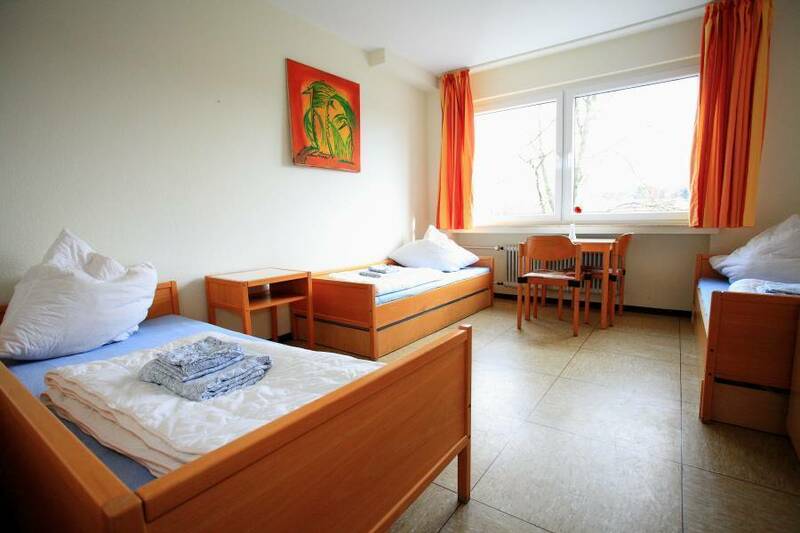 The hostel is located in a lovely place. The building is quite big and equipped with all modern comforts. You can also sit outside under a big roof, to protect you from the rain and enjoy the nice view to a natural park and the panorama of the south west part of Bochum. On the other hand you are in the very heart of the Ruhr Region with over 5 Million habitants – it is a dynamic region with lots of cultural, scientific, economic and leisure activities. The guest rooms have their own bathroom and it is also possible to use the kitchen with additional costs. The house is a non smoking area. Smoking is possible on the big roofed veranda. A large room can also be booked for events and parties. If you can play the piano you are also welcome to make a show, all the arts and performance are appreciated. Please note, check-out is until 11 a. m.
Check-in is from 3 p. m. until 9 p. m.
For early and late check in please inform via phone or email us 24 hours before you arrive. If you find the door closed or the reception unmanned, please call the phone number posted outside and on the reception. The hostel is partnered with a cultural center so you will often find a variety of cultural programs, events, and people on the grounds working, relaxing, and creating. 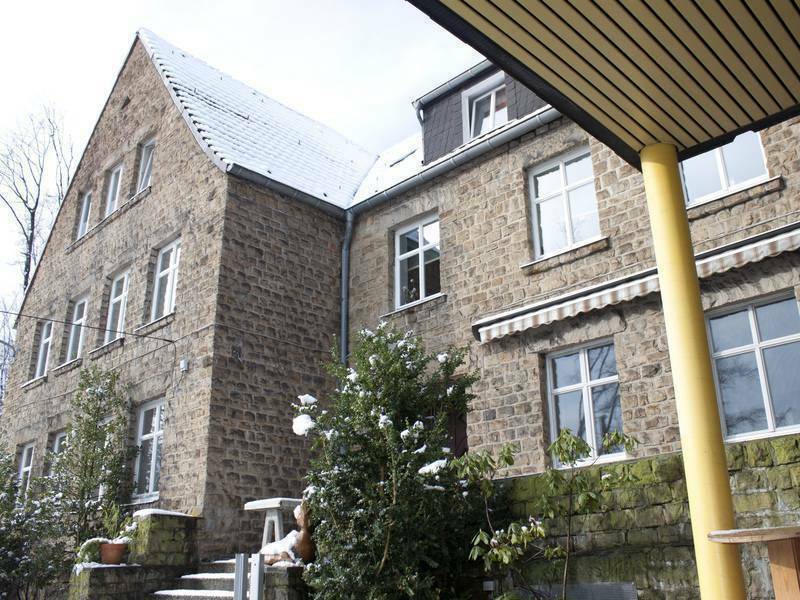 BOLA Haus der Kulturen, Academy and Hostel Ruhr has a long tradition. It is a place where culture, arts, music and video projects can be mixed to create a unique feeling. We have a variety of comfortable rooms to choose from all of which come with fresh, clean linens. Dorm facilities have shared bathrooms while private or double rooms come with private bathrooms. 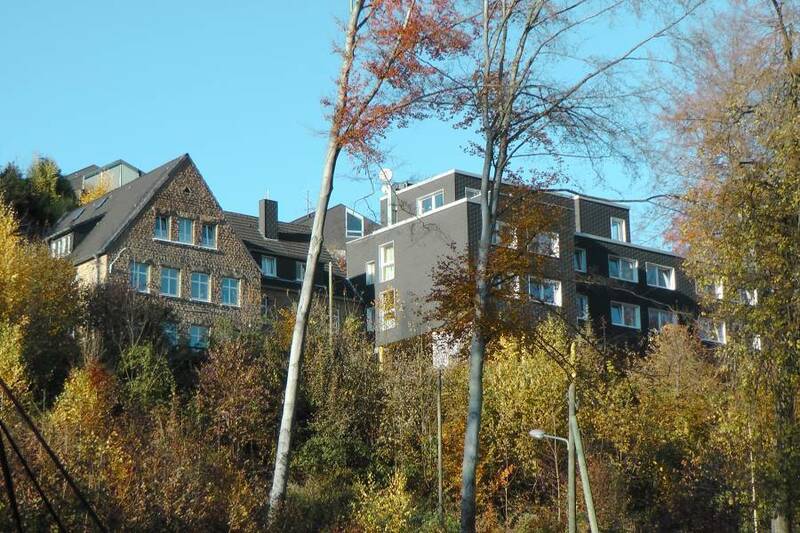 Previously a nature house, BOLA Cultural Hostel is a freeing and relaxing place located in the heart of the Ruhr Region, a dynamic region with many cultural, scientific, economic and leisure activities. The hill-top location in the forest provides beautiful panoramic views of the nature park, all of which can be viewed from our covered veranda or explored on foot. Coming out of the train station, you find LIDL supermarket on your left. Follow that road to the bus stop. At the bus stop, turn right and follow the road to the big round about. Then you need to walk straight ahead for about 6 minutes. When you see the street "Herbergsweg", turn slightly left and you will see a small path leading through the forest. It's a 3 minute climb from there to the BOLA. Alternatively you can follow Herbergsweg for a few metres more and use the steps to your left. There are also signs that lead your way.